Credit union membership can and should be a benefit for every family member—including children and young adults. Help a young one start saving today! Studies show that the earlier you start saving money, the less you’ll actually have to save. Why? The power of compounding dividends will work in your favor. 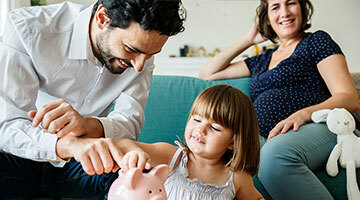 Another reason to start saving early is to establish good savings habits. Learning to save, budget and manage at an early age will ensure you are on the path to a successful and bountiful financial future. The First $5 is on Us! Blue Flame Credit Union offers several savings products designed to jump-start a new saver and their saving plan including certificates. We’ll even make the initial $5 deposit to establish your young person’s membership with us! Savings accounts make great birthday and milestone gifts and allow you and other family members to make contributions throughout the year. We make the first $5 deposit to establish the membership. No minimum balance or fees. Balances earn higher dividends than our Regular Savings. Checking Accounts with ATM/Debit Cards available. Opportunities for Credit Cards and Vehicle Purchases. Low $25 deposit to open certificate. Make additional deposits at any time without penalty. Choose from 6-, 12-, 18-, 24- and 30-months terms for optimum flexibility. No opening or maintenance fees. If you are opening an account for a minor, remember to provide a copy of the minor's birth certificate or social security card.